Quiet lightweight compact and easy to use Atco electric lawnmowers are ideal for smaller gardens. As with all Atco products our 16E mains electric lawnmowers are designed to maintain your lawn to the highest standard and are packed with features to make using them as efficient and pleasurable as possible. Features include large wheels for enhanced manoeuvrability centralised height of cut adjustment a grass bag full indicator and camlock fittings for easy folding of the ergonomic handles for compact storage. 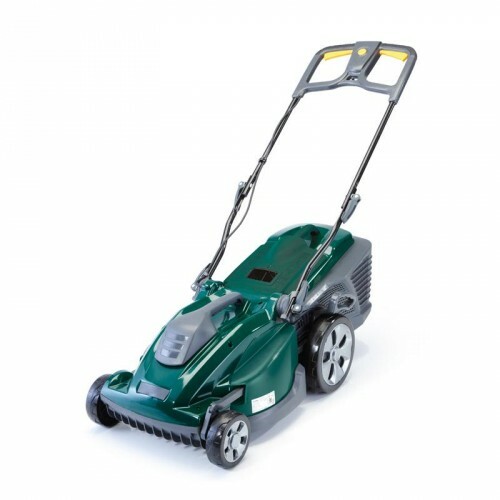 This model also has an integral rear roller that leaves a beautiful striped finish to your lawn and is also supplied complete with a mulching kit - just insert the mulch plug to finely cut grass clippings into a nitrogen rich mulch which is recycled back into the lawn as a natural fertiliser.